Dodge intricate bullet patterns as you blast your way through an unrelenting onslaught of enemies with a fully customized weapon and shield loadout. Pick and choose from tons of parts and modifiers to make each weapon your own. Battle through multiple full-featured Campaign levels, go for a high score in Endless modes, and prepare to face off against retro-inspired bosses. You need to physically move to survive in this neon-bathed world straight out of ’90s VHS cover art. 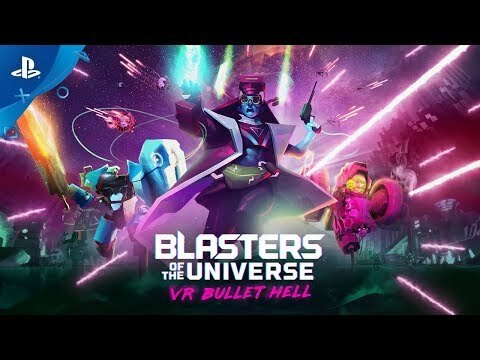 Blasters of the Universe challenges you to survive the wrath of the virtual space lord, Grand Master Alwyn – an insecure man-child who was once the undisputed king of the local arcade. He uploaded his consciousness into virtual reality in the 90's and constructed a vast virtual universe in his own likeness. Join the battle, take back VR, or die a thousand VR deaths. Fully customize your weapon from frame to barrel to magazine. Test your ammo. Select your shield. Head into battle. Grand Master Alwyn's digital hordes attack from every direction. Learn their weakness and adapt your style. If you're going to survive, you’d better be ready to move. Duck, dodge, twist, turn and maneuver your way through VR bullet hell. © 2018 Secret Location, Inc. All rights reserved. © 2018 Archiact Interactive Ltd. All rights reserved.